Breaking Professor Stereotypes: Homi Bhabha. Seriously. Trust me on this one. Okay, Arnold and I will be the first to tell you that Bhabha is damn near incomprehensible. Yet he breaks professor stereotypes in one spectacular way—he has serious fashion skills. Don’t believe me? Even if you haven’t seen him in person, Bhabha is regularly recognized in the Boston Globe for his style. He was even listed as one of the Most Stylish Bostonians in 2007, along with Ray Allen of the Boston Celtics. Bhabha gets this sort of attention for good reason. He’s like the Tim Gunn of critical theory. I desperately want to link to one of the Globe’s photos, but you will have to see it for yourself. The Harvard Crimson also has a photo of Bhabha in a man-scarf. If you took a photo of Bhabha working it, let us know, and we’ll add it to the site. Consider the type of job you want. If you are shifting into finance or anything near the law profession, you will probably need to invest in some good suits. But, thanks to the rise of the dot-com world, office wear has become more casual. I’ve seen Hawaiian shirts. I’ve seen dudes wear the same shirt two days in a row (yes, I noticed). I’ve seen Birkenstocks. That said, the West Coast is more formal than the East Coast or the South. Scope out the job first. 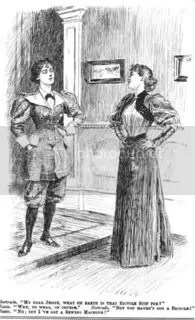 Penelope Trunk, a sharp career blogger, once advised that people should stake out where they will interview. You don’t need to make like a private detective, but take a walk past the place. Aim to visit either in the morning, at lunch, or in the evening so you can see people coming and going. Someone over at the “So You Want to Go to Grad School?” forum asked what you wear to grad school classes. This is a fascinating question, as many people wind up in grad school because they really, really do not want the trappings of a hamster world job, especially the uniform. A suit is not necessary, although there will always be one person in your cohort who opts to dress like a cast member on Trump’s “The Apprentice.” Nothing wrong with that, but don’t let him make you feel like you forgot to read a dress-code memo. Then I can wear a T-shirt, flannel, and jeans? That’s the real dress code, right? No. Grunge is dead. You need to be presentable, especially if you are teaching. The goal is to look more together than the people you are teaching. In some cases, you need to look older than the people you are teaching so you can project authority. Even on days when you aren’t teaching, you still need to polish up slightly because you might run into students on campus. Save T-shirts for Fridays, and wear new jeans, not old ones that are riddled with holes. What about tattoos or nose rings? Your smell matters, big time, possibly more than your look. Eau de Grad Student can get a little funky, like a combo of ramen and unwashed socks. You’re busy, and you may have a stack of papers to grade, but always take a shower before you mingle with the public. Otherwise, Rate My Professors might need to add a “stinky” face. This is one way to earn the respect of your students. 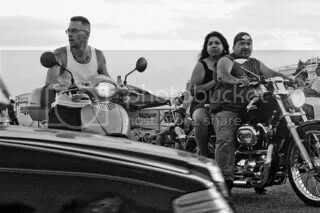 Image of Republic of Texas Biker Rally by Dustin Ground of Austin, TX, from Wikimedia Commons under a Creative Commons license.